I moved to Catalonia 3½ years ago and decided to study Catalan after finishing my course in the Spanish language. Obviously, as an expat I also had the same questions and doubts: should I learn the Catalan language, do I really need it, is it practical, will I get into society? In my Spanish school, I heard from many international students that Catalan people are very closed and even if you learn the language, that’s not the way to get into the society and make local friends. Well, that depends. Besides, I wasn’t looking to connect to anybody specifically. However, living here and almost not knowing locals was weird and at the same time generated curiosity. I wondered about their days, evenings, if they invite friends home, how do they spend different holidays, etc. Honestly, I had no idea at all. Barcelona looked like as a mysterious town, you can’t really discover how local people live unless you get closer to them. It starts with learning a language. The funny thing that I noticed was in the beginning I spoke only English, I connected with the international community. Later, after having studied Spanish it helped me to understand the culture better and make Spanish friends. I have even learned some typical phrases such as “No tiene pelos en la lengua”, “Habla por los codos”, “Feliz como una perdiz”, and “La suerte de la fea, la guapa la desea”, which was a fun way to laugh in a group. Try to use some of these typical phrases and Spanish people will definitely appreciate it. What about Catalan? After learning Catalan, I gained some insight on Catalan culture, people and how to communicate with them, what they like, dislike, etc. What happens when you speak Catalan? “Parles català molt bé…”. Oh, come on, that was far from truth but felt motivating. You are remembered: They would remember you. Despite whenever and wherever they meet you, they won’t lose the opportunity of mentioning how well you speak Catalan. You might feel shy or disagree, but they will keep telling you that you do it well. So be ready for a lot of praise whether you want it or not. Are Catalans closed? Well yes and no. Eventually it is relative, and it depends on who you are comparing them with. I do agree that it´s not easy to get into their circle, but once you do, you become a part of it. From what I have noticed, Catalan people would gather in small circles and they don’t like changing people inside it. If you speak the language, it’s more likely you’ll become one of their group. Unlocking the locked. Also, you might be invited to a house to have a dinner and practice some Catalan. They would help you if you have doubts about the language, always open about it. Get ready for “sopar” and a nice talk. 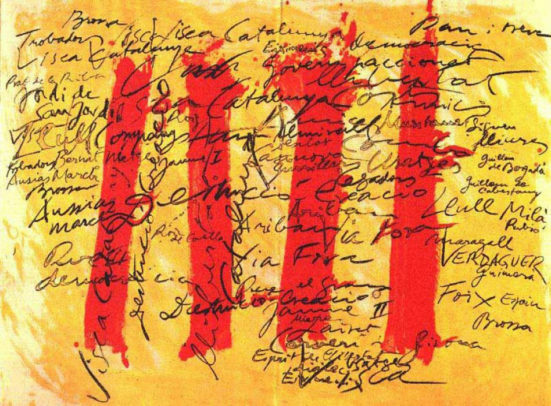 Is it obligatory to speak Catalan? Will I need it in my job? Many expats ask this question. Language is not an obligation, it’s a way to connect to people so it totally depends on what your objective is. Ask yourself these two important questions. Is your stay in Catalonia short-term or long-term? Do you want to be a part of the international community only or are you looking to connect with local people as well? Regarding a job, I guess it’s only required in a few companies. Catalans are polite. Even if you are in a group of 10 people and they speak Catalan they would politely switch to Spanish if you don’t speak the language. That’s a myth saying that Catalan people don’t want to speak Spanish at least I have not felt that in Barcelona. The situation outside of Barcelona might differ. Finally, as a general advice, don’t be frustrated if you feel that you can’t get into the society where you live. Locals are a bit closed everywhere. I think there’s an explanation for this. When you are new in a city country, you want to connect with people as you have your family and friends back home. So, you’re eager and super excited about attending events, knowing people, going out whenever there is an opportunity. Local people have families and friends here and their circle is kind of established. Probably they are not as open not because that they don’t want to but they already have their people. The interesting thing that I noticed is that the events locals and foreigners tend to go to vary quite a lot. Obviously, there are some where you have the whole mix but at the same time there are some places where it’s mostly local or expat. I would encourage you to learn at least basic Catalan if you plan to live in Catalonia. It should not take much time, especially if your language has a Latin origin. As I mentioned in the beginning, opinions are my own coming from my own experience and maybe some people have different ones. But I hope you find these tips and insights helpful. If you’re interested in learning Catalan while you’re in Barcelona then check out this post. If you’d like to write a guest post then please get in touch via the email address at the bottom of this website. I’d love to hear from you. I am Marie-Ora from I am an expert writer and language whiz and would like to write an article for homagetobcn.com. Hi Maria-Ora! You can email me at rob@homagetobcn.com.